Looking for an interesting restaurant experience to commemorate the New Year? Vancouver has quickly become one of the most sought foodie destinations on the globe. Vancity boasts the best oriental restaurants, outdoor escapades topped with a vibrant nightlife, as it claws out of the “no-fun city” reputation. There are food options for every kind of food fanatic. Plus something new always seems to be around the corner. Whether you're heading out drinking with clients, friends, or a date you'll find a venue suited to the occasion. Yet many locals are opting for something a little more unusual for 2018 and these unique venues are becoming more popular amongst visitors, locals and even the famous! Every second is an experience at the Dark Table. Vancouver’s first and only blind restaurant. The moment you’re ushered inside be prepared to see, absolutely nothing. Your senses become hypersensitive just 10 minutes after walking through the front door as your waiter describes the restaurant as well as what’s on the menu for those of us that can’t read braille. To add, the restaurant hires blind wait staff. They are the true artists in this environment, so there’s no need to worry about fumbling food or swaying drinks; at least not from the staff. The dinner and drinks is an excellent experience as it requires coordination during the meal. It’ll add a whole new meaning to blackout. As the seafood mecca of the west coast, naked sushi has gradually made it’s way into Vancouver’s mainstream. There are several companies offering variations of dishes but the one common factor still remains. You’ll be eating fish off naked people. Body Sushi is one of the more popular businesses with a Facebook page, pictures and a raving fan network. Oringinally from feudal Japan, it was only a matter of time (albeit a long one) before Vancouver's sushi scene was given a more "personal" touch. Video game lounge meets cocktail bar. EXP is one of the few places in the city where you can order themed drinks, then head over to the nearest game console and play your favourites. Points are credited to regular patrons that can be used online or in store. Located near the heart of Gastown, EXP always has an event going on. Most recently quiz nights and charity events. You can expect your inner child to feel at home here. These days, the restaurant has started incorporating board games with their inhouse tournaments where visitors can participate and compete while sipping drinks amongst the city’s nerdiest. You want eccentric? Then head down to Davie’s Elbow Room cafe. The cafe pulls no punches in it’s no bullsh*t style and even advertises their service on their menu. Just reading some of the reviews of praising patrons and perturbed visitors gives you a sense of the cafe’s dynamic. Yet, even with the odd set up and colourful word choice, The Elbow Room cafe hosts one of the most popular brunch spots in the city. Those of you preferring elegance and class are warned to stay in Cactus Club with the lawyers. 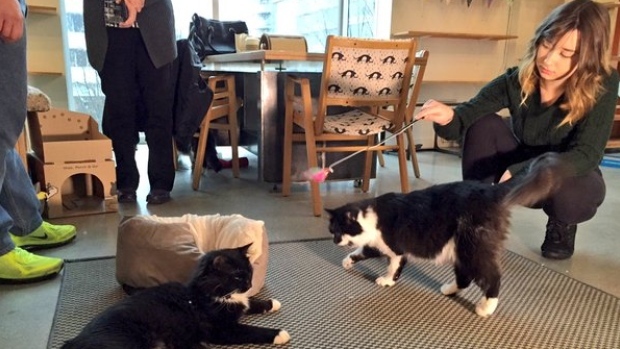 As a self-diagnosed cat lover I couldn’t wait for Vancouver to finally open it’s very first cat cafe. These special restaurants have been popping up around the world’s largest cities. Often popular to tourists and cat people, it’s a great place for the family to come down and play with friendly cats. Though if cats are your thing, be prepared to spend a little longer at the Catfe than you originally thought! The cats come are all adopted and vaccinated. You can imagine these cute kitties get a LOT of attention at all hours so don’t feel saddened when you see a few of them tuckered out in the corner. Then again, if cats or online shooters aren’t you’ thing than come by the Ox Lounge. A comfortable set up and laid back atmosphere without anything particularly unusual or odd. We host live music, down to earth staff and a sizzling menu (without eating off naked people). Drinks are kept classy as you enjoy Vancouver’s next up and coming cocktail lounge.